There is nowhere in the world like Australia, and The Ghan and Indian Pacific offer unique and memorable ways to explore its vast length and breadth. In 2019, as The Ghan turns 90 and the Indian Pacific approaches half a century, the exciting evolution of these iconic journeys is just beginning. Much has changed since 1929, when the original Afghan Express completed its inaugural journey to Alice Springs. Today, guests are welcomed into a world of heightened wonder, style and adventure. The first thing you’ll notice about your Platinum cabin is the abundance of space. The in-cabin breakfast is also a treat. Ready yourself for an incredible experience on The Ghan Expedition. This epic four-day, three-night, 2979-kilometre train journey begins in Darwin where friendly staff lead you to a private Platinum Service Cabin. Our Platinum Service delivers deluxe extras such as transfers, in-cabin breakfasts, all-inclusive beverages and access to Platinum Club where chefs prepare menus using local fare. 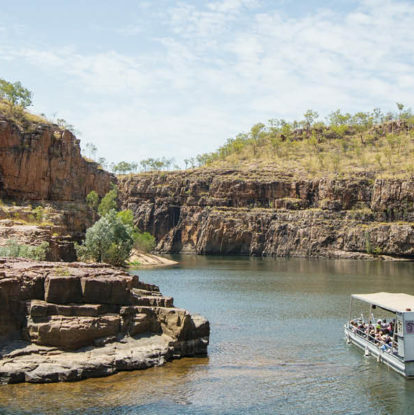 In Katherine, choose your first Off Train Excursion at the spiritual Nitmiluk (Katherine) Gorge or enjoy the Katherine Outback Experience, an award-winning celebration of life on the land. Back on board, enjoy a five-course dinner as the train rolls onwards. An incredible outback sunrise sets the tone for the next day. After breakfast, arrive in Alice Springs to embark on a full day of touring. Come evening, dine beneath a canopy of stars at an authentic Outback BBQ, a unique experience with live Australiana music and a mouth-watering feast. The incredible dinner under the stars experience at the Old Telegraph Station in Alice Springs. The following day, pull into Manguri, the outback stop from where you’ll be whisked away to the sun-scorched opal mining capital of the world, Coober Pedy, where more than half of the residents live underground. The next morning, the landscape transforms from rich ocher tones to the pastoral lands of South Australia. After breakfast, reflect on your journey before The Ghan rolls into Adelaide where you can extend your stay or plan your next epic rail journey. Share the spirit of The Ghan Expedition; visit Journeybeyond.com or call +61 8213 4401. The Ghan Expedition operates between April and November 2019.